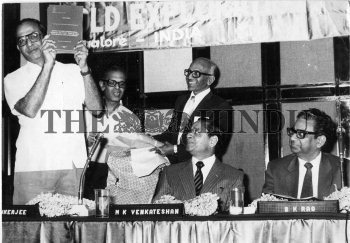 Caption : S.K.Mukerjee, Director General of Geological Survey of India releasing a souvenir at the United Nations Inter Regional seminar on Gold Exploration and Development at Bangalore, the Capital of the southern Indian State of Karnataka. M.K.Venkatesan (seated at the centre), additional chief secretary to the Govt. of Karnataka and B.K.Rao (far right), secretary, Govt. of India, Dept. of Mines look on. 1985-02-25.